With J.R.R. 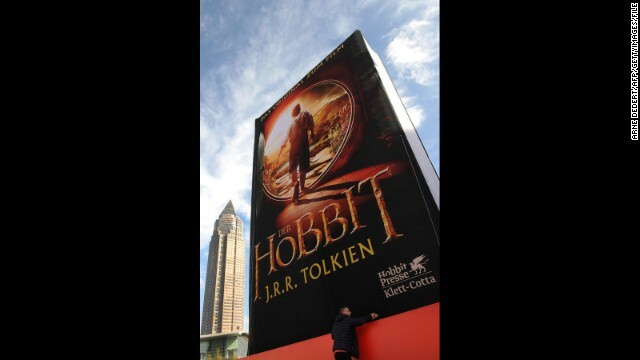 Tolkien's "The Hobbit" as popular as ever thanks to Peter Jackson's trilogy, Hollywood's starting to mine the author's life story. The Los Angeles Times reports that a biopic about the writer, who also created "The Lord of the Rings," is in the works. Presently being referred to as "Tolkien," the film would explore Tolkien's life and the influences behind his beloved fantasy books. The script is reportedly being written by David Gleeson, a "Tolkien super-fan" whose past screenwriting experience includes "The Front Line" and "Cowboys & Angels." No word on how quickly this project could move into theaters but it is expected to cover all the highlights for Tolkien fanatics and newbies alike, delving into his years at Pembroke College and his World War I service in particular. Long before Tolkien's story arrives, we'll get to see his hobbit, Bilbo Baggins, fight to win back the dwarves' ancestral homeland in the two remaining "Hobbit" movies, "The Hobbit Desolation of Smaug" (December 13) and "The Hobbit: There and Back Again" (December 17, 2014). I would rather see the Silmarillion made into either a movie or miniseries/anime. It could probably be done relatively cheaply as an anime, and then one would not need it be marketable to the masses. I'm not sure I would that interested in a biography-movie of anyone. Then don't go see it – real simple. Wonderful news! I hope Peter Jackson is involved with it. It would be his fitting tribute to Professor Tolkien. You must be a Middle Earth p0rn star to have a name like that.